Chris Allen gets a start after a long injury lay off following his 45 minutes in the Somerset Premier Cup. The visitors however welcome back former Premier League striker DJ Campbell to their starting line-up. Dan Bowman also returns for City with Dan Ball suspended for this game. Maidenhead started the game well testing the City defence with Danny Green getting in a couple of left footed shots. 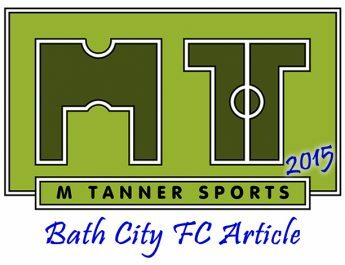 Their best chance came when their top goal scorer Dave Tarpey crossed in from the left hand side onto the unmarked head of Eddie Hutchinson but it drifted over the bar. The front pairing of Dave Pratt and Nick McCootie gradually began to get on the ball more particularly on the right hand side through Bowman’s crossing. Frankie Artus went close from a McCootie cross in the box following the referee playing on a foul on Bowman. Bath’s own defence is far from perfect this season with Andy Gallinagh already struggling to contain Green on the right. Jason Mellor misses the ball from a cross on the left falling to Green on the right with just the goal to aim for but Gallinagh reacted quickly to block the shot to save a certain goal. City had their chances to go 2-0 up in the first half the closest being Allen’s cross hitting the post after it evaded everyone with a bounce in the area. Artus also went close with a long range shot on the volley and McCootie forced Will Britt into a smart stop. So the half ended 1-0 to City through the unfortunate own goal with City having the most joy on the right with Bowman. Chas Hemmings was also playing well in the holding midfield role spraying the ball about well. Maidenhead on the other hand had the threat of Green on the wing and Tarpey (before he went off injured) on the other side. Their defensive problems where there for all to see though with Pratt and McCootie gaining some cheap free-kicks. Just before the break there was a proper non-moment when a Maidenhead sub was about to come on, for the injured Tarpey, but he was wearing the wrong shirt. So there was a delay as the bemused midfielder had to quickly find a new shirt from the tunnel area and change it. The second half started with both team looking to get the all-important second goal of the game. McCootie and Pratt continued to get the better of the back four and McCootie put the ball on a plate for Pratt after getting to the by-line. However a brave block from a Maidenhead centre back stopped the goal bound effort. Maidenhead decided to take off the experienced Hutchinson at half time and replace him with the running of Connor Waldon. The tricky winger almost got lucky when he got the better of Bowman and cut inside with a fierce drive; which went just wide of the near post. City were now on the front foot but Maidenhead could still do well on the counter. However this attacking threat changed when Harry Pritchard was sent off. The full back received a straight red after a reaction to a Bowman foul. Sponsor’s MOTM Hemmings was full of confidence and was allowed more room to get forward against 10 men. He had an ambitious shot from around 40 yards out which only just goes wide. Once Ross Stearn was introduced to the fray the quick footed winger had a shot from 30 yards; which got a slight deflection putting it out for a corner. The corner was then played out to Ashley Kington, on for Artus, and on to Hemmings who has a dig from distance but straight at Britt. A pleasing site was City fans was the return of centre back Phil Walsh was make his comeback from injury some months ahead of schedule. This will provide a healthy competition for places and another option up front; with only Martin Slcombe to return from injury. There was even time for Kington to have a shot in the last attack of the game, the keeper spills again but Pratt following up is offside. That result puts City back on 0 goal difference and up to 11th in the Conference South. Maidenhead are ahead of City, along with 3 other teams on a point more. City could move about all four teams when they entertain Gosport Borough, who are one of the four, on Tuesday night. It won’t be an easy game though as Gosport have only conceded one away goal all season! Maidenhead look like they are coached well with good ideas and tempo to their play. You can see why they have scored so many with the likes of Campbell up front but their defence leaves a lot to be desired. The management team are clearly very intelligent with their coaching methods they just need a better quality of players to carry out their instructions.